When my mom saw some youtiao (Cantonese; also known as Chinese donut or Chinese crueller) at Sun Sing Pastry yesterday, a light bulb hovered over her head. She wanted to make jook (Cantonese; aka congee or rice porridge). We even stopped by a market to get some preserved egg for the jook, on our way out of Oakland Chinatown! 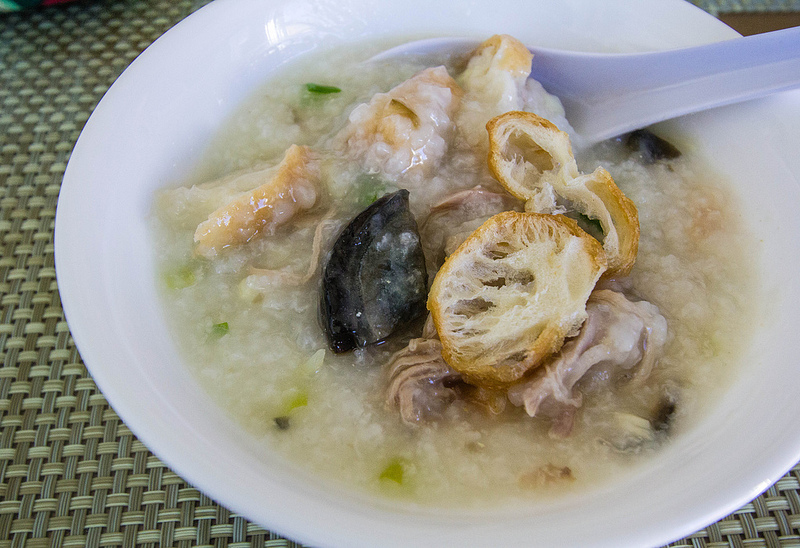 The jook my mom made had pork, preserved egg, youtiao, ginger, and green onion. Century egg or pidan (Chinese: 皮蛋; pinyin: pídàn), also known as preserved egg, hundred-year egg, thousand-year egg, thousand-year-old egg, and millennium egg, is a Chinese cuisine ingredient made by preserving duck, chicken or quail eggs in a mixture of clay, ash, salt, quicklime, and rice hulls for several weeks to several months, depending on the method of processing. Even though the traditional method is still widely practiced, modern understanding of the chemistry behind the formation of century eggs has led to many simplifications in the recipe. For instance, soaking the eggs in a brine of salt, calcium hydroxide, and sodium carbonate for 10 days followed by several weeks of aging while wrapped in plastic is said to achieve the same effect as the traditional method. This is because egg-curing in both the new and traditional methods is accomplished by introducing hydroxide ions and sodium into the egg. The poisonous compound lead(II) oxide increases the curing speed of century eggs, which has led to some unscrupulous producers in the past adding it to their curing mixtures. However, zinc oxide is now used as a safer alternative. Although zinc is an essential micronutrient, excessive zinc consumption can lead to copper deficiency, so the zinc content needs to be checked for safety.